The museum is home to an amazing collection of scale models, including those below, built from scratch by enthusiasts who tend to be in the top echelon of craftsmen. Model plane devotees will enjoy viewing the wide collection of locally made models on display. They are in varying sizes and scales, up to 1.5 metres long and wingspans of 2.0 metres. 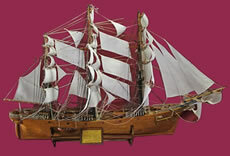 Model ships up to 2 metres long are also part of our diverse collection. Army vehicle models are made from many materials by scratch-builders who, as with all our models, tend to be more discerning when it comes to accuracy and detail and they spend far more time on far fewer models than a kit assembler. This is a model of the ship that brought the last Kanakas to Maryborough from the South Sea Islands on the 20th October, 1903. The Kanakas were used in the district to cut sugar cane from 1867 to 1903. This scratch built model took R. Hillier approximately 600 hours to make from red and white cedar. The hull is double planked on frames. 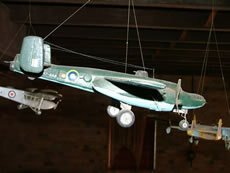 Models are on display of most aircraft used by the R.A.A.F. handmade from timber by former aircraft engineer Ron Noblett. In our library are the technical details and numbers of every plane owned by the R.A.A.F. prior to 2005. This is a unique and valuable record of aircraft and their use by the R.A.A.F. 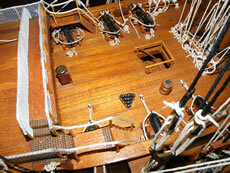 In February, 2012, Mal Thorpe's model of the 'Cutty Sark' arrived for display. The ribs are made from silky oak and the hull from French oak out of old wine barrels. Mal's wife Nancy makes all the sails on her sewing machine. 'H.M.S. Victory' was a project of 3,500 hours. Red cedar timber was used for the hull of the ship and English Oak for the decks and mast. The model was presented to the museum in April, 2009 by craftsman Mal Thorpe. Pictured is detail of the ship's deck. Read more about Mal here! Cliff Hutchings of Gympie has crafted 1/35 scale models of forty Australian and American WWII vehicles. The former builder started model making in 2001, when he was confined to a wheel chair and stuck in the top of a two story building. The model making kept his fingers and hands working until recently when it became impossible to hold the small pieces. He now paints birds in acrylics from photographs he has taken himself. Read more about Cliff's models here!